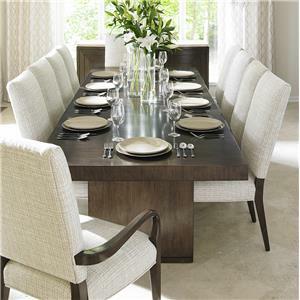 The minimalist beauty of the Parsons table design is perfectly captured in the Archetype Dining Table. A decorative veneer pattern shines on the wide table top in the Goldenrod or Quicksilver finish, while in the Alabaster finish the table has a painted finish. Satin Brass bar stock embedded at each corner provides a finishing accent. The table is designed to fit eight guests without the leaf, and when the leaf is installed, the table can comfortably seat ten. 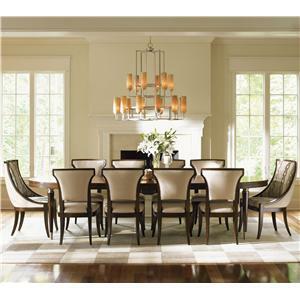 With a veneer pattern inspired by Madagascar's Bismarck palm in Goldenrod or Quicksilver finishes or a crosshatch painted finish in Alabaster, the Madagascar Arm Chairs and Side Chairs bring worldly style and minimalism to your dining room. Despite the understated elegance of its sculpted shape, the chair cradles its occupant in luxuriant comfort. 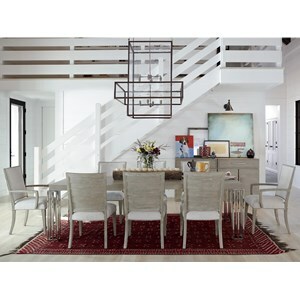 The chair seat and back are expertly upholstered in a linen-textured fabric to provide maximum comfort. 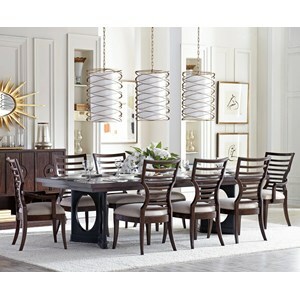 The Panavista 9-Piece Archetype Dining Table Set by Stanley Furniture at Stuckey Furniture in the Mt. Pleasant and Stuckey, South Carolina area. Product availability may vary. Contact us for the most current availability on this product. Case Construction Parawood solids and primavera veneer. Select accent items with faux shagreen. 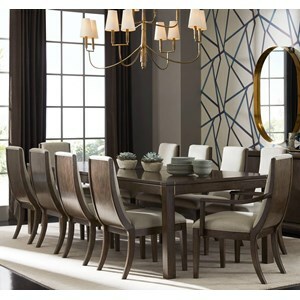 Browse other items in the Panavista collection from Stuckey Furniture in the Mt. Pleasant and Stuckey, South Carolina area.